Let’s go back to when Joan and I were 12 and 9, halfway to ten. A boy from school — kind of a thug who was bigger than the rest of the boys in Joan’s class because he’d been held back — had a crush on her and followed her home from school. Although Joan could hold her own around girls, exhibiting a devil-may-care attitude that made them envious, boys — especially big boys with loud voices like this one — made Joan watchful and quiet. I watched from the living room window as Joan avoided the boy around the spherical juniper bush until he grabbed her sleeve and pulled her close to kiss her. When she screamed, I dashed out the front door and rammed head first into the boy’s side. He turned, enraged. “Who do you think you are, you little twit?” he asked derisively. Joan wiped away a tear. “Leave my sister alone!” I screamed, face flushed, taking s step back as I raised my fists. Joan laughed. “You’re both crazy like your mom,” he sneered before spitting into the juniper and sauntering away. Although Joan put her hand over her mouth as we walked toward the front porch, I could see the smile beneath it. Looking forward to reading Rosalyn Carter’s new book Within our Reach, which covers the recent history (past 30 years) of mental illness in America and how today, recovery is more possible than ever before. 20% of Approaching Neverland to NAMI! 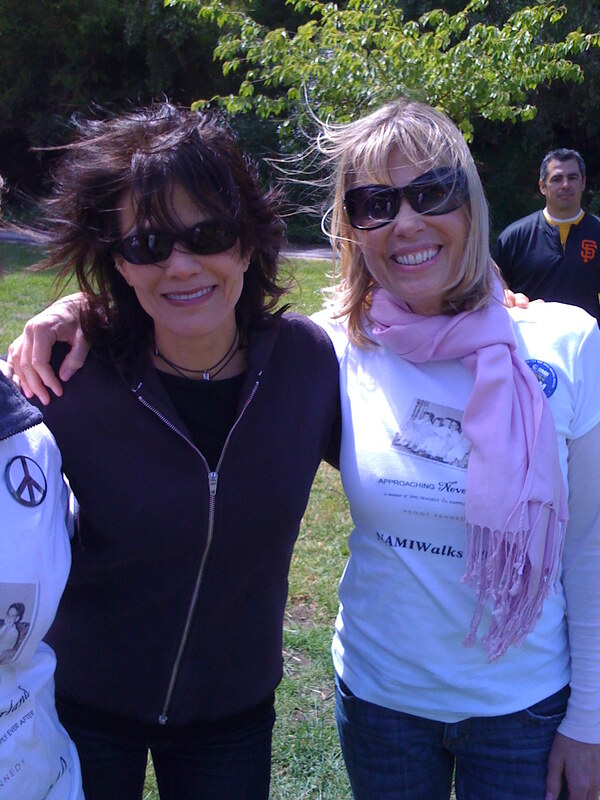 In honor of Mother’s Day and my wonderful mother Barbara who had acute bipolar disorder, if you buy a copy of Approaching Neverland now thru May 31, 20% will go to NAMI Walk SF Bay Area to help other families dealing with mental illness! The Health Care bill signed into law today should help to improve the lives of individuals and families dealing with loved ones with mental illness. One important thing about the bill is that it requires mental health parity with that for physical illnesses in terms of annual and lifetime treatment benefits. This would also require “carve-out” programs, or specialized managed care organizations that provide mental health services, to comply with parity requirements. I’m hoping this makes a big difference in quality of life for the one in four families dealing with mental health issues. There’s nothing better than talking to a group of people who get together for the sole purpose of doing good things for their community. I had the great pleasure of talking about families dealing with mental illness with the Alamo Rotary this afternoon. My hope is that organizations like Rotary will help spread the word to families in their communities who are struggling with with mental illness that help is available through organizations like the National Alliance on Mental Illness, which provides a crises help line, education, and family-to-family training in a supportive environment.